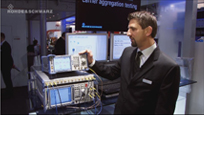 Rohde & Schwarz presented the most compact test system for mobile wireless location-based services at the GSMA Mobile World Congress 2013 in Barcelona. The R&S®TS-LBS supports all major radio access technologies such as LTE, WCDMA, GSM, as well as major GNSS standards including GPS, Galileo, Glonass and Compass/BeiDou. The system performs A-GNSS conformance tests, protocol conformance and operator test plans.